It was so exciting to see my former colleagues at Chippewa Nature Center's Nature Preschool (where I was the founding director) and the current research team I'm part of featured on this PBS Newshour piece! Click here to see the PBS NewsHour post including a full transcript. For more on this research check out my previous research blog post. At the Nature-Based Preschool National Conference 2017 (Aug 2-5) in Seattle, WA I presented a research poster session. The poster presented work by a team including David Sobel of Antioch University, Dr. Lori Skibbe, Dr. Haruka Konishi, and me all of Michigan State University. Many at the conference expressed interest in having access to the poster for use in their work. So, here it is! Please let me know if you have any questions. We will be working over the next several months to get this research into a journal article and (hopefully!) published soon after that. In the meantime, feel free to cite this poster. Did you know May is "Living Schoolyard Month" in California?! 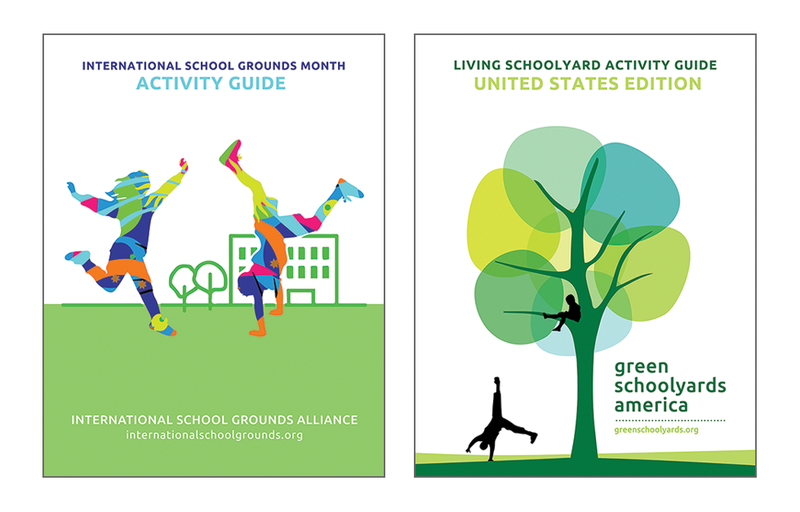 As part of the celebration Green Schoolyards America has published activity guides for maximizing your schoolyard space. I was honored to be part of this great project. Check it out here and share with your friends! If you're thinking of starting a nature-based preschool you might be interested in an article I recently wrote for the Natural Start Alliance's March Feature Story. My article "Program Considerations for Establishing a Nature Preschool" can be found here. You might also be interested in another article related to starting a preschool program which was written by my colleague and friend Dave Catlin. You can find his article titled "Getting Down to Business" here. I hope both articles are useful for you--the world needs more nature-based preschools! Maybe I need to start thinking about turkeys more often. Well, maybe not just turkeys. I suspect we all need to take more time to reflect on what is it that we have, in our own backyards, that bring awe and wonder to visitors. These are most likely the same things that awaken awe and wonder in young children. After all, both are looking with fresh eyes and seeing a world they’ve yet to explore, discover, and master. I think we also need to take more time to be grateful for the relationships we have made with our particular places in the world. I love the smell of freshly worked soil in the farm fields in spring. Summer rain also has a special smell that I love. Fat, bright yellow-green sassassafras buds make me happy in spring. These are details a tourist likely wouldn’t see on their first visit, or maybe even 10th visit. I now see these details because I’ve been a relationship with my local natural resources—place. Yes, there is magic is new-ness, but there’s also magic in a long-term relationship with a place. It’s the same as with making friends—new ones are great and so much fun, but oh how old friends really are gold (as the song goes). So, as you go about your day today look for the things that a tourist might have natural resource envy over, things you can share with young and old who are still building a sense of place where you are, but also look for the nuanced details that a tourist might never see. What are the things you now know about your old friend that others might not yet know? As for me, I’m off to beach! I recently gave a professional development presentation about natural play areas. As sometimes happens (ok, it happens quite a bit), there were comments of "But we're not allowed to..." However, most of the time the rules the person is referring to don’t actually exist, but instead are an urban legend of sorts within the preschool. Sometimes the rules do exist, but based on very different contexts (For example, children aren't allowed to play on climbing structures when there is ice on the ground because of fall zone/surfacing issues, but that gets translated to never going outside when it's icy). I’m amazed the number of rules that people assume exist because so-and-so told them that’s how it was, and don’t ever take the time to find the actual rule in black-and-white print. Any time a policy or practice seems odd to you, makes your gut say “that’s not right!”, or you know is just plain crazy, I strongly encourage you to ask the powers that be to show you the rule. Of course you should ask in a respectful manner, but also a persistent one. Too often silly rules, or worse yet urban legend, become gospel in early childhood programs, and as a result limits the opportunities that children have to play and explore. As I said, I have MANY conversations at workshops that start something like, “That’s great, but we’re not allowed to…” At some point during the conversation I almost always reference Lisa Murphy's article on shaving cream. It’s definitely worth the read. Yes, we want to provide safe learning environments for young children, but sometimes rules that are supposed make children safe are just silly. WE have to be a rational voice for children when they can’t be that voice for themselves. Case in point, going outside below 10 degree wind chill is not unsafe if children are dressed appropriately, and yet I have talked with many professionals who work for programs where children aren’t allowed outside in those temperatures—even if they have the right clothing. Check out Lisa Murphy’s article, ask questions, and keep fighting the good fight--children are counting on you! In January I led a webinar focused on developmentally appropriate practices for informal nature-based early childhood programs. This webinar was hosted by the Association of Zoos & Aquariums, and they have been very generous to share it publicly on YouTube. This webinar was made possible by the Disney Conservation Fund as part of the AZA's Nature Play Begins at Your Zoo & Aquarium Program. Thanks to AZA for this opportunity--it was a lot of fun! Have you seen “Snow,” the parody of Adele’s song “Hello,” floating around Facebook? It’s spot on! The song, written and performed by Mary Morris a third grade teacher in Tennessee, definitely brings to life the secret thoughts of teachers everywhere regarding snow days. After all, what teacher hasn’t thought, “I need a mental health day. Please, just ONE snow day”? Every teacher has. If they tell you otherwise they’re lying. Heck, even as a preschool administrator I hope for a snow day now and again, and I still have to report. It’s just the idea of a free day. It’s a glorious thing. You might be able to guess what I did next. I shook my iPhone while saying something along the lines of, “Exactly! They should be outside! Have them put on a coat and hat and go outside!” Just as all teachers wish for snow days, all teachers hate when their kids have to stay in for recess—especially for multiple days in a row. Why? The kids are restless, squirmy, and generally lack attention—not to mention some of them get downright cranky. This leads me to my plea to administrators and teachers everywhere: Please don’t keep children inside for recess because it’s cold or rainy! Of course this isn’t a new plea. Others have made it and I’ve made it many times before as well. Sometimes I’ve heard a response something like, “But it’s cold out.” To which I respond, “Then they’ll need warm clothes.” That is usually countered with, “But children don’t have outdoor clothes.” First of all, I will make another plea to parents—dress your children in clothing appropriate for the weather! Children at Chippewa Nature Center's Nature Preschool are outside for half of their class day unless the weather is dangerous (i.e., thunderstorms). Even after that, what if the children still don’t have the right clothing? Well, if a child doesn’t have a pencil do you send them home for the day? No, of course not! You get them the appropriate tool for their cognitive development. Why not get them the right tools for their physical development? To do this many schools have written grants for extras pairs of rain suits (I highly recommend Oakiwear), gloves, hats, and even boots. It’s also helpful to leave muddy or snowy boots in the hallway and have the children change into “indoor shoes” for inside the classroom. (The janitorial staff will thank you.) These are simple hurdles to overcome in order to provide daily outdoor time for children. The outdoor recess time, even in the cold and rain, will be greatly appreciated by the students and teachers alike. The extra bonus is the physical activity and time outdoors will also help with their attention when back inside focusing on learning. In other words, with recess everyone wins—the teachers and the children—and no one loses their mind! I'm very excited to announce that Dave Catlin (David Catlin Consulting LLC) and I are joining forces to offer business planning consulting for organizations looking to start a nature-based preschool! Dave and I each bring a unique set of skills to the table that make us an ideal team for assisting any organization looking to get into the nature-based preschool business. The services we will provide include all aspects of business planning--market assessments, strategic plan facilitation, architectural pre-planning, budgeting, and everything else required to get a preschool up and running. As Dave said, "Nature centers, parks, zoos and individuals all over the country are joining a growing trend to get young children outdoors by creating nature-based preschools. Their confidence in the business side of things doesn’t always match their passion and enthusiasm, though. We aim to help with that." Click here for the press release with more details or contact either of us to get started! Last month I had the great fortune of traveling to Scotland for a Nature Kindergarten Study Tour with Mindstretchers. Also on that trip was Clare Nugent of Fern Top Nature Preschool in Fairview, Tennessee. Clare and I have been emailing for a few years as she was establishing the Fern Top program, and it was such a thrill to finally get to meet in person! Even more fun was meeting on such an exciting adventure. I always learn so much from colleagues like Clare. Our work is also much more enjoyable when we're sharing ideas with like-minded people who quickly become friends. For more about my trip visit check out "My Summer Vacation: A Nature Kindergarten Study Tour in Scotland" on the Natural Start Alliance website. Clare Nugent and me in front of the welcome sign at Auchlone Nature Kindergarten in Crieff, Scotland.